Kids will love them for their pop of colour and ease of use; mums will love them for their retro vibes and awesome functionality. As springtime knocks on Australia’s door, we happily bring you Jelly Baskets: vintage totes for stylish gals of any age. Bright, funky and super-fun, these full-sized and mini handbags are the perfect accessory for the sun-filled days ahead. Designed in the UK by Sun Jellies, Jelly Baskets are colourful carryalls that stand out from the crowd. They are available in two practical sizes: the full-sized Jelly Basket and the super-cute Mini Jelly Basket – perfect for little misses who want to jazz up an outfit and tote those treasures in style. Jelly Baskets are made from 100 per cent recyclable PVC. Full-sized Jelly Baskets are available in Pink, Black, Coral, Violet, Yellow, Mint and Hot Pink. 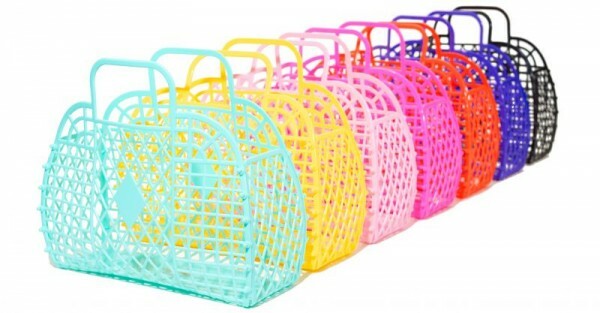 Mini Baskets come in Mint, Blue, Pink and Yellow. Fittingly, each bag comes with its own name – from “Daisy” the yellow Jelly Basket to “Matilda” the pink Mini, these funky bags make colourful friends for fashionable girls. Jelly Baskets and Mini Jelly Baskets can be picked up at Amarose Kids Decor for $22 and $15 respectively. Head over to Sun Jellies to check out other fabulous products in the range – including those much-loved Jelly Shoes.